The third running of the Pegasus World Cup crowned City of Light the victory, while the inaugural Pegasus World Cup Turf went to Bricks and Mortar. Catch the recap and replays here! 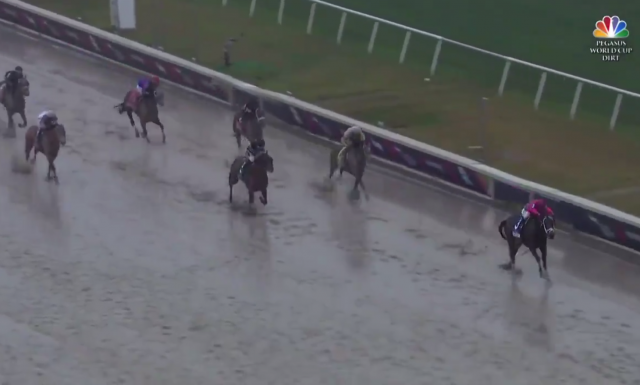 Saturday was certainly soggy at Florida’s Gulfstream Park, where the turf track was labeled “yielding” and the main track “sloppy.” The conditions themselves presented enough of a challenge for horses seeking to claim the generous purses of the Pegasus World Cup and the brand-new Pegasus World Cup Turf — and then there was still the rest of the field to contend with. The gates were full for both races with some of the best in the world lined up for their chance at glory: horses came from not only the United States but Japan, Ireland and Mexico, adding plenty of international intrigue into the star-studded Pegasus World Cup Invitational day. The Pegasus World Cup Turf went to Bricks and Mortar, a five-year-old son of Giant’s Causeway making only his second start after a 14-month layoff. That’s the kind of layoff that makes you think about retirement — but one might argue that Bricks and Mortar came back better than ever. Trained by Chad Brown and ridden by Irad Ortiz, Jr., Bricks and Mortar settled mid-pack out of the gate, letting the race set up around him. Ortiz’ patience paid off — despite falling to near-last into the turn, Ortiz waited for his moment to turn Bricks and Mortar loose, roaring past tiring foes to cross the wire two and a half lengths in front. Irish invader Magic Wand finished second, just over Delta Prince. On a sloppy main track that looked more like soup than a racing surface, the Pegasus World Cup became the match-up race fans had been hoping for — Patternrecognition rocketed out of the outside gate position to take the lead, but City of Light, winner of the Breeders’ Cup Dirt Mile, settled just behind, eventually taking over the lead somewhat early in the backstretch. When Accelerate, himself the winner of the Breeders’ Cup Classic, made his move to challenge City of Light coming to the top of the stretch, Gulfstream erupted as the predicted match race was on — but Accelerate was no match, as it turns out, with City of Light repelling him easily and kicking away to a winning margin of five and three-quarters. Seeking the Soul got up over Accelerate for second. City of Light is trained by Michael McCarthy and ridden by Javier Castellano. WATCH: #BreedersCup Dirt Mile Champ City of Light brightens a stormy day at @GulfstreamPark and wins the Grade 1 Pegasus World Cup! Both Accelerate and City of Light will now retire from racing to stand stud at Lane’s End Farm. As the sun sets on one era of racers, it rises on another — Kentucky Derby prep races are just around the corner.